I'd like to request a passkey that can be set in the admin panel and then forced on registration so as to stop spammers, and have a private forum that only privileged people can register on that I have previously approved. My forum is mainly for people I talk to online and not really anyone else at the moment so I think this will be pretty necessary for my site. I'll probably need to edit the templates for member_reg and add some things into the member.php file. However, with little PHP knowledge (and even then my understanding of PHP only extends to one specific forum package which is very badly coded), I won't be able to do this. 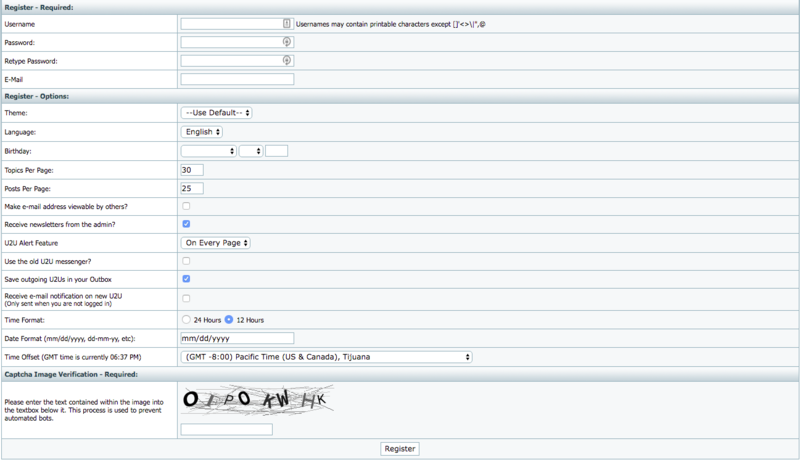 and you can set up a forum with passwords for specific forum fids. Unfortunately, this didn't work, it still let my test registration in. Maybe I need to create a new template? I'm not sure everything about XMB's codebase. Does your board not have the Captcha Image Settings? Look at the attached files below for reference. It doesn't have said function because I haven't installed the dependencies for it yet. Also, CAPTCHA doesn't stop persistent humans or such, so is useless. For some reason my community has been rather a big target for spammers due to a few feuds I have had with others, usually resulting in me disabling registration access for a few days. I'd rather keep registrations locked rather than completely disabled, though. I'm working on a hack for you. Oh cool, thanks! It's awesome to see people are sticking around and helping others out. :3 I appreciate what you're doing A LOT. Let me know if you have troubles. I will try and help you out.